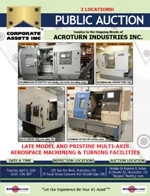 Corporate Assets Inc. | Acroturn Industries Inc. - Corporate Assets Inc.
Monday, March 31 from 9:00 A.M. to 5:00 P.M. & morning of auction to start of auction. Small items: Wednesday, April 2 by 5:00 P.M. Remaining: Wednesday, April 16 by 5:00 P.M.
LATE MODEL AND PRISTINE MULTI-AXIS AEROSPACE MACHINING & TURNING FACILITIES – 2 LOCATIONS FEATURING: HYUNDAI-KIA (EST 2009) SKT250TTSY, CNC multi-axis, opposed spindle & twin turret live milling center (REPLACES FOR OVER 300K NEW! ); HYUNDAI CNC multi-axis, opposed spindle live milling turning center; (2) HYUNDAI HIT-30S, CNC turning centers; HYUNDAI HIT-200, CNC turning center; HYUNDAI HIT-8, CNC turning center; HYUNDAI-KIA (EST 2008) HI-V600D, CNC twin pallet vertical machining center; KIA HI-CENTER V50D, CNC twin pallet vertical machining center; HYUNDAI (2001) SPT V550D, CNC 4 axis twin pallet vertical machining center; HYUNDAI SPT-V30TD, CNC twin pallet vertical machining center; MIYANO TSV-C35, CNC twin pallet vertical machining center; (2) FADAL (2002) VMC-2016L, CNC 4 axis vertical machining centers; FADAL VMC 1520, CNC 4 axis vertical machining center; HITACHI SEIKI VS50, CNC 4 axis bridge type vertical machining cell; HITACHI SEIKI VM40III, super productive CNC vertical machining center; (2) HITACHI SEIKI CNC vertical machining centers; KENT (2003) KGS-1020MS1, high precision hydraulic surface grinder & more!